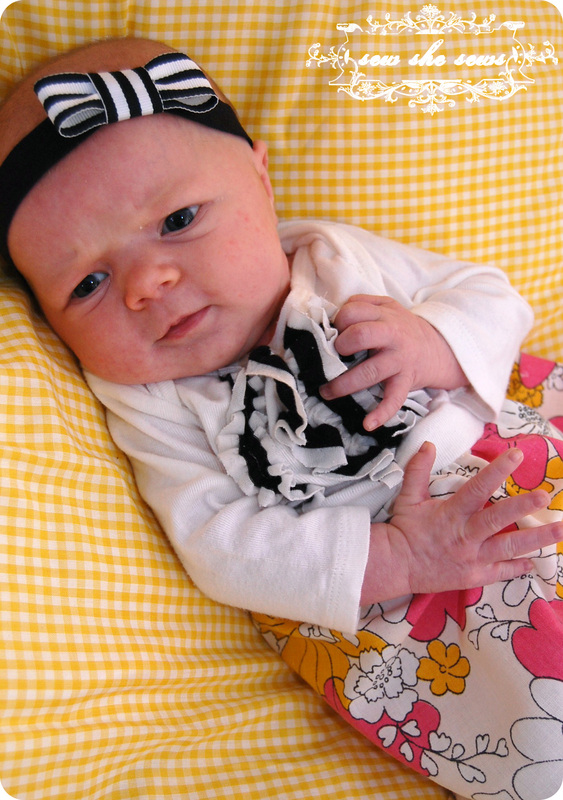 « It’s been this kind of day…..
1-1. 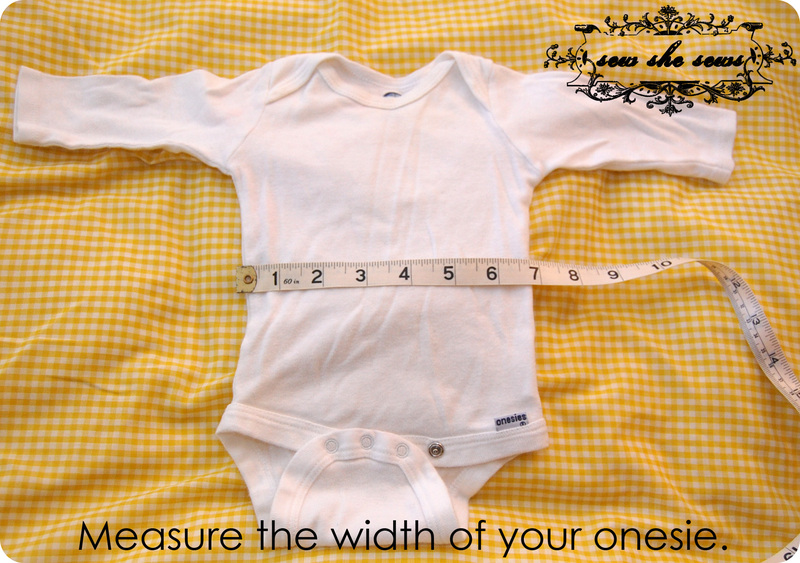 Measure onesie’s width across. 3. 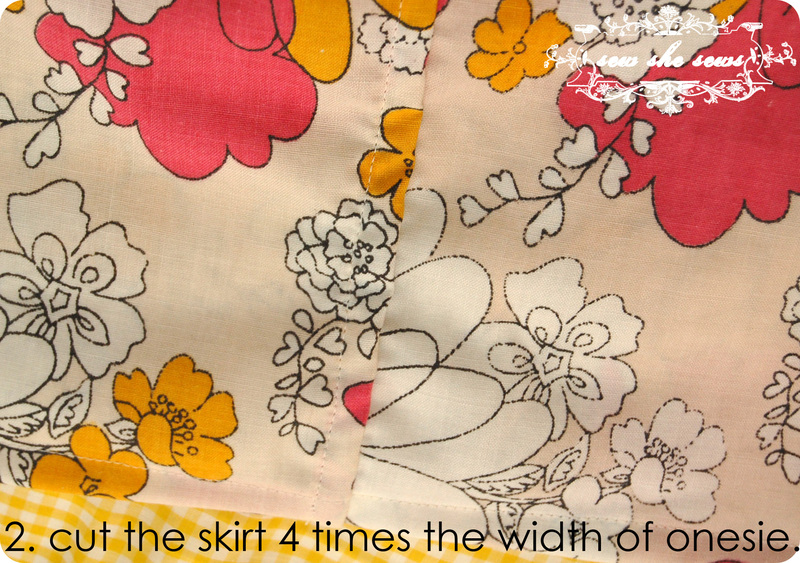 Hem the bottom of the skirt piece first. 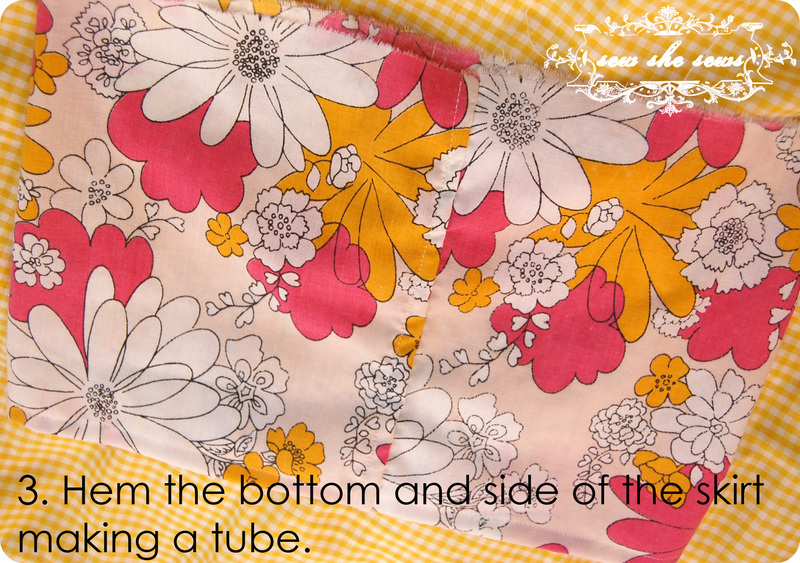 Then sew the sides together. I used a felled french seam since I didn’t have a serger and didn’t want to zig zag. Any of the 3 are suitable. This will make a tube. 4-5. 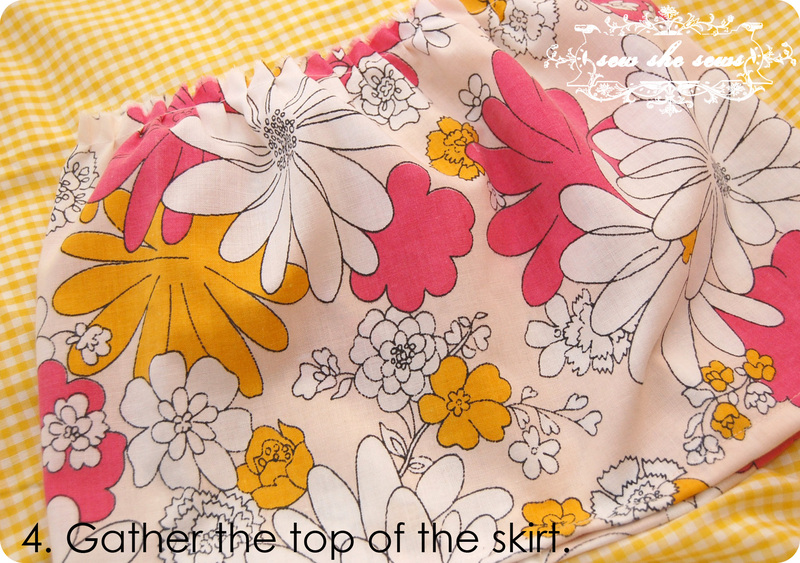 Gather the top of the skirt. This can be done with a special gathering or ruffler presser foot, or you can baste (large stitches) and gather. 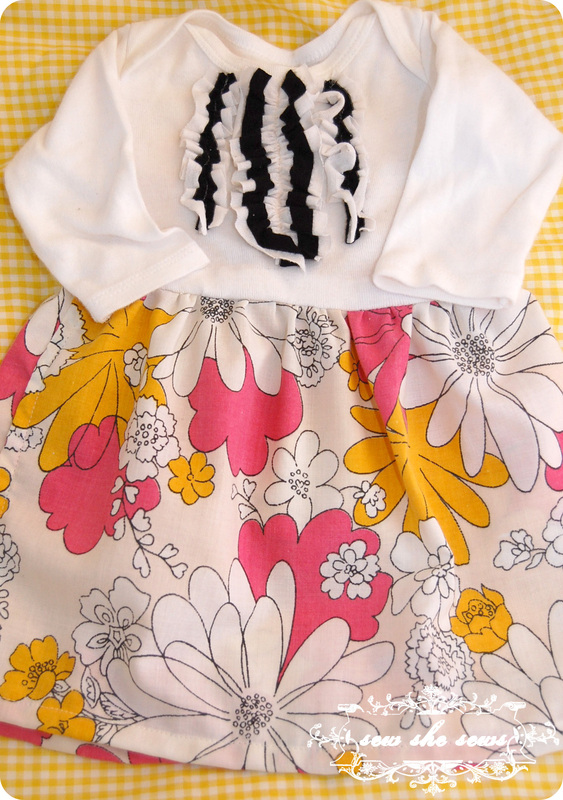 If gathering, you will want to make the skirt half the size on front and back to fit the onesie. 6. 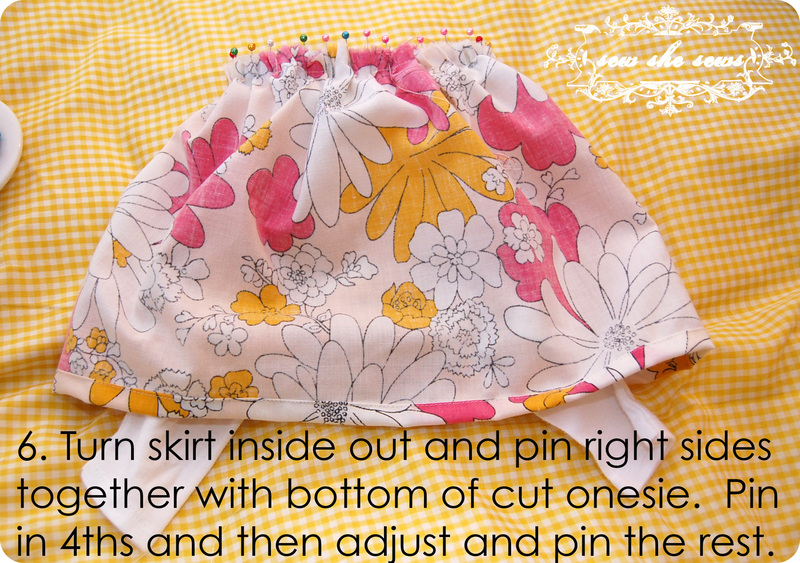 Turn your skirt inside out. 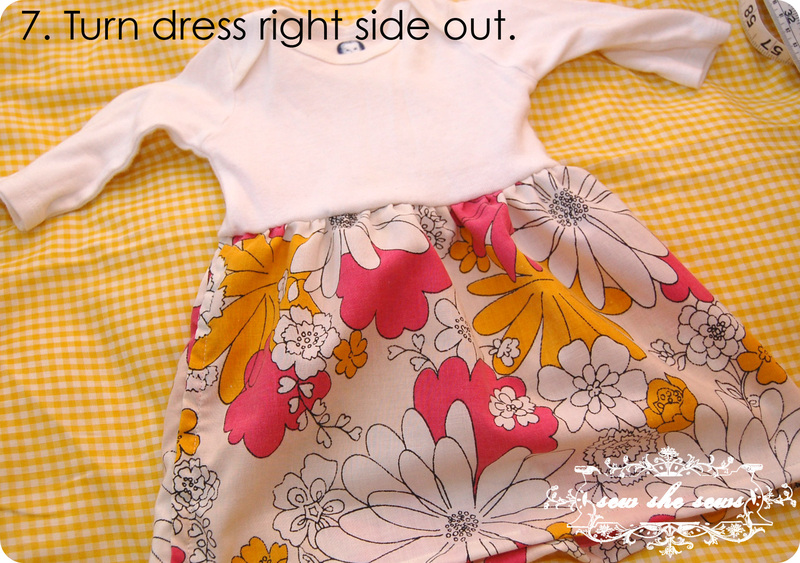 Tuck the onesie inside the skirt so that the raw edges match together right sides together. Pin at the side seams and then in the middle in front and back. 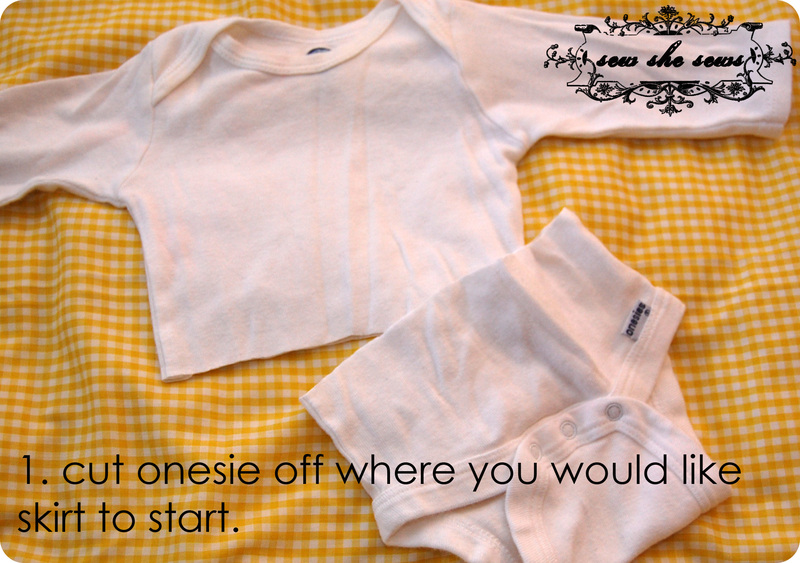 Arrange gathers equally in the quarters of the onesie and pin into place. 7. 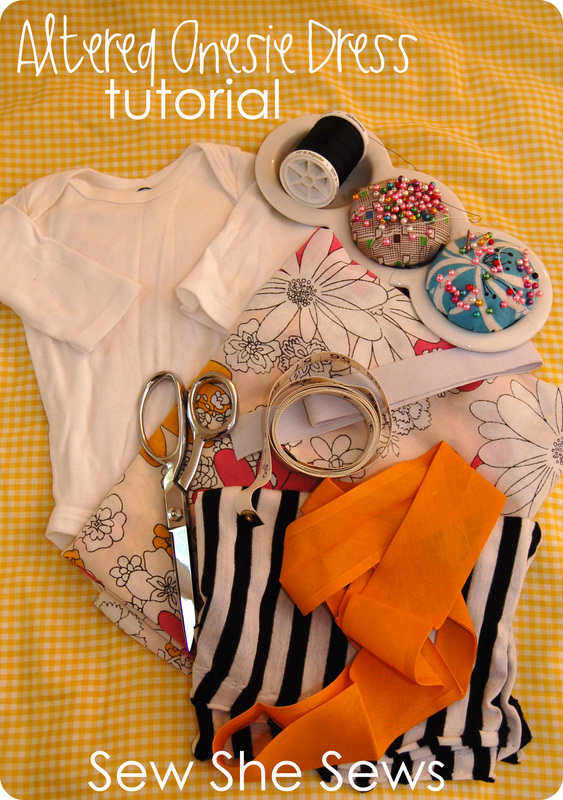 Sew onesie to skirt. Make sure your seam allowance goes below that gathering stitches so they don’t show. Flip right side out. 8. 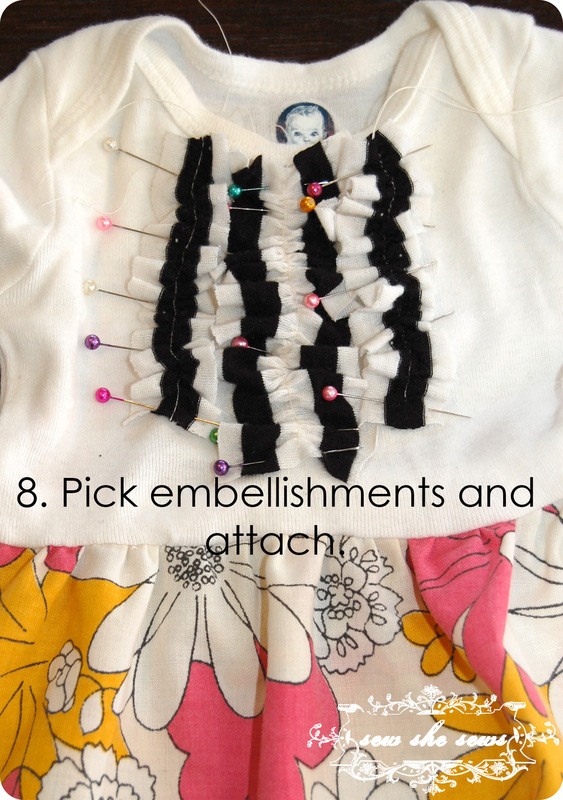 Determine how you want to accessorize the dress and attach with pins and sew. 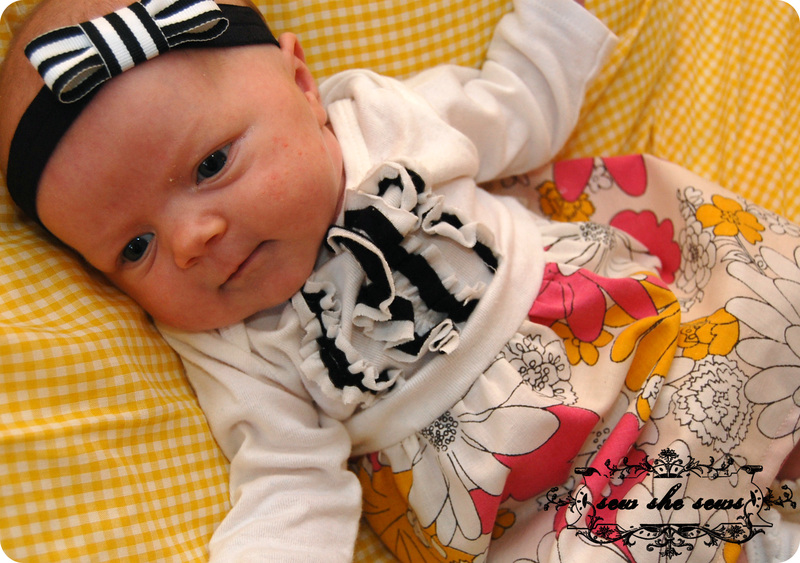 For this dress I cut striped knit jersey into strips and gathered them into ruffles. Super cute!!! I sure hope you’ll send me some. 🙂 I miss and love you! 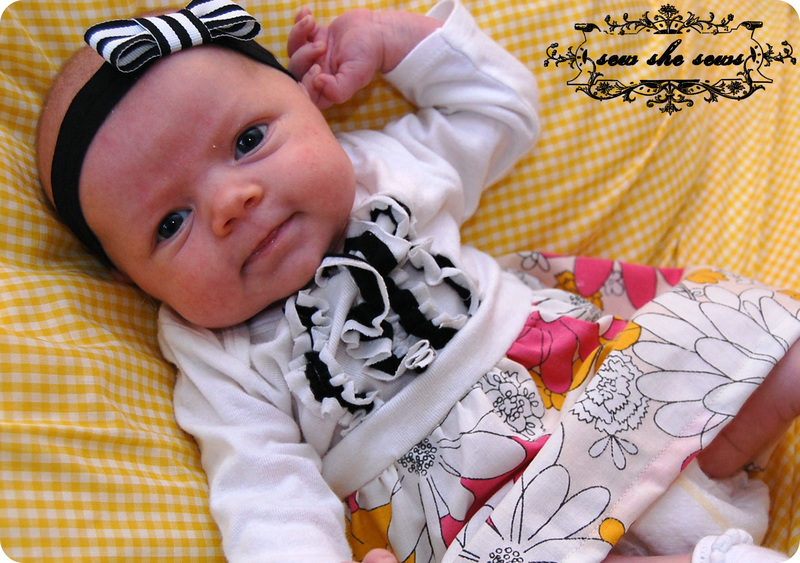 OMG she is so adorable! Love the altered onesie. 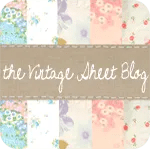 Thanks for adding this to the link party. Nice Tutorial. would have to do these for my baby next time..